Departing Ipswich chief executive Simon Clegg claims he was made a scapegoat by Roy Keane for the Irishman's failure as manager of the club. Keane, who left Town in January 2011, has said he regretted not meeting Clegg before taking the job in April 2009. Clegg told BBC Radio Suffolk: "I know he needed to blame someone for failing to succeed at Portman Road and he was savvy enough not to blame the owner. "But he had a dig at me and fine, you take it on the chin." He continued: "You need to have fairly thick skin as the chief executive at a football club." Keane guided Ipswich to a 15th-place finish in the Championship in 2009-10 - his only full season in charge - and the club were 19th when he was sacked midway through the next campaign. Following his departure, the former Manchester United and Celtic midfielder said: "My mistake was that I agreed to take the Ipswich job before meeting their chief executive. "That's a vital role when you're working with somebody so closely. I won't be doing that again. Looking back now, Ipswich maybe wasn't the right club for me." 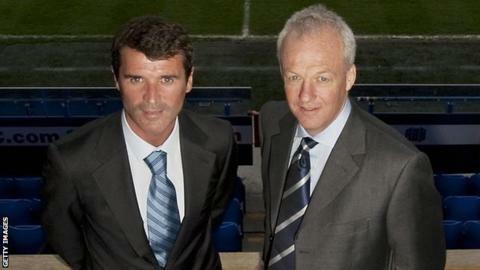 Clegg, a former boss of the British Olympic Association, refused to be drawn into Keane's comments at the time. "I was disappointed and surprised," said the 53-year-old. "From my perspective it didn't represent the working relationship I thought we had." Clegg has spent almost four years as the public face of the Ipswich board, working directly to owner Marcus Evans. But Clegg has taken the brunt of fans' criticism for the club's inability to mount a serious promotion challenge in that time, despite making it his aim to bring Premier League football to Portman Road. "In that regard, yes, it has been a failure," he conceded. "I wanted to secure success for the football club. I wanted to be part of that journey of taking us into the Premier League. "The easy thing would be to say it's through lack of investment, but you can't argue that. Marcus has backed each of his managers since he has been at the club with considerable finance. "I've signed 73 players since I joined the club four years ago. Fans wish to criticise someone - and as the public face of the club that is one of the responsibilities I have had to bear." Evans, a businessman who has bankrolled Town for the past five years, has consistently maintained a low media profile. Clegg has said his departure is, in part, designed to give Evans a more "hands-on" role, but does not expect the owner to be stepping into the spotlight. "I think that is unlikely," he added. "He's not totally shared that with me yet. They're still working on that through."